This is what it is all about. Read the paper, and be very frightened! Sweeping new emergency laws to counter UK terror. Sweeping measures to deal with terrorist attacks and other emergencies are to be announced this week, giving the Government power to over-ride civil liberties in times of crisis, and evacuate threatened areas, restrict people’s movements and confiscate property. Some of the proposals in the draft version of the Bill, drawn up in the summer, have alarmed civil rights activists, notably a clause that gives the Government the power to suspend parts or all of the Human Rights Act without a vote by MPs. Once an emergency has been proclaimed by the Queen, the Government can order the destruction of property, order people to evacuate an area or ban them from travelling, and “prohibit assemblies of specified kinds” and “other specified activities”. If these rules had been in force during the Iraq war, critics say, they cou ld have been used to to ban street demonstrations, making anyone who travelled to protest guilty of a criminal offence. After a major terrorist attack, forums made up of local councils, the emergency services and utility companies would be put in charge of trying to get shattered communities back together. Other measures will be welcomed as a timely reaction to last week’s carnage in Istanbul, where 57 people were killed and hundreds injured by suicide bombers. The US already has the Patriot Act, rushed through Congress after the 11 September attacks, which has been criticised for its effect on civil liberties. Such fears will have been heightened yesterday by General Tommy Franks, who commanded the coalition troops in Iraq and who has become the first high-ranking US official to talk openly about scrapping the Constitution in the wake of a major terrorist attack. “The worst thing that could happen is if terrorists acquire and then use a biological, chemical or nuclear weapon that inflicts heavy casualties,” he warned. The effect of an attack on that scale could be to provoke Americans to “question our own Constitution and to begin to militarise our country in order to avoid a repeat of another mass, casualty-producing event – which in fact, then begins to unravel the fabric of our Constitution,” he said. The Civil Contingencies Bill, which is being handled by the Cabinet Office minister Douglas Alexander, will be announced in Wednesday’s Queen’s Speech . More details will be made public on Friday, when a committee off MPs and peers publish their conclusions after four months examining the proposals. Civil liberties groups have been alarmed by the Cabinet Office’s sweeping definition of an “emergency” and the powers it confers. It is defined as an y event that represents a serious threat to the welfare of the population, th e environment, political or economic stability or security of any part of the UK. This includes wars, floods, a breakdown of power supplies, outbreaks of animal diseases or any situation that “causes or may cause disruption of the activities of Her Majesty’s Government”. -) Let me tell you about my last experience, for an Art Ed friend, who wanted reportage-style for her wedding to a publisher at a certain large East Midlands company. – 1100 : wedding itself passes off without incident at registry office, chaos outside afterwards as bride does her pieces at drunk new husband. Puzzled looks from many who know her as a serious drinker who has twice busted her leg when falling down. forgotten about him for 7hrs). Groom says something to Bride, who storms out and is not seen again. Guests adjourn to bar, commence therapeutic drinking. – 2300: decorated-to-the-point-of-vandalism groom’s car placed on bricks, to prevent him trying to drive. Which is unlikely on all fours. – 2330: I flee the scene, terrified of a predatory woman guest who seems to have decided I’m ‘giving her a lift home’ in the Biblical sense. Three weeks later, just after I delivered a bunch of prints and the bill, the groom left his wife for another man. I never did get paid. She’d suffered enough without me hassling her for money for a reminder of her spectacularly disastrous, humiliating, life-ruining special day. Anyone who tries to bring about change for the better is going to come into contact with the law. This is inevitable, but it is nothing to be intimidated by. You have the right to protest and to be heard. In this website we provide materials to introduce you to your legal rights, and to what to expect if you are misfortunate to run into trouble with the law. It is important to know your rights and to stand up for them to prevent them being taken from you. Often the police and others will use intimidation and ignorance to suppress those who want to change the status quo for the better. By being informed you help yourself and your movement. ‘No-Bush’ demo in Nottingham in Market Square. Starting with a public trial of this bloke for crimes at 12:00 noon and at 5pm, a sit-down and march around town. A trial of President GW. Bush, was held in the Market Square, Nottingham this afternoon. Hundreds turned out in the city centre, to demonstrate dis-pleasure at this mans activities, and to hold him to account! The jury heard the evidence presented, that he was general bad-hat. He was found guilty. Later, many more turned out, heard speeches and then went of for a march around town to gather yet more support and show our feelings for this visit and policy. This was what we did in Nottingham, a small part of the international effort. Here is a selection of photos, describing the day ….. The Freelance is the bulletin of London Freelance Branch of the National Union of Journalists. These are some of the articles the newsletter has run about difficulties faced by reporters on demonstrations, and what can be done about them. They link to more. All reflect personal views. This site is to keep to up with the mans’ itinerary … Help us track George W. Bush across London! If there is only one STOP BU$H event that you can make – this is the one. “Public order situations” can be difficult. Especially if you’re a photographer, and the only place you can do it from is in the thick of it: often sandwiched between police officers, who just want everyone to go away (or stay put, depending on their orders) and protesters, some not seeing a difference between press and police photographers. The NUJ has held a series of meetings with the Metropolitan Police to see how things can be improved. On 5 November (at 8am!) General Secretary Jeremy Dear, with LFB members Molly Cooper, Jess Hurd, Paul Mattsson and I met Deputy Assistant Commissioner Andy Trotter, Commander Mike Messenger and press officer Anna DeVries. A particular issue is that the union consistently gets reports of police officers failing, or refusing, to recognise the Press Card or appearing not to be aware of the system for verifying cards using a PIN. The Association of Chief Police Officers (ACPO) will, we heard, soon circulate guidelines and publicity about the press card to police stations. The Met agreed to look at ways in which the union can be involved in briefings before major events, and at least at ways of making sure that the needs of journalists are mentioned at these. Andy Trotter said that the problem of journalists being held in pens with protesters will “perhaps be a decreasing issue”. Asked what a journalist who needs to get through a police line should do, he said: “Get to the cordon and talk to a supervisor – the sergeant or inspector – look for stripes and pips”. If you can’t do that, call the Met Department of Public Affairs 24-hour number: 020 7230 2171. The force will also look at ways that these issues can be raised in Public Order training. We hope to arrange a visit by members to the new Gravesend training centre. Of course, problems are as likely to arise in the course of normal policing or outside London as they are in major events in the Met area. We hope to arrange a meeting with ACPO to begin to deal with these issues more generally. We need to hear how these things are playing out on the streets. 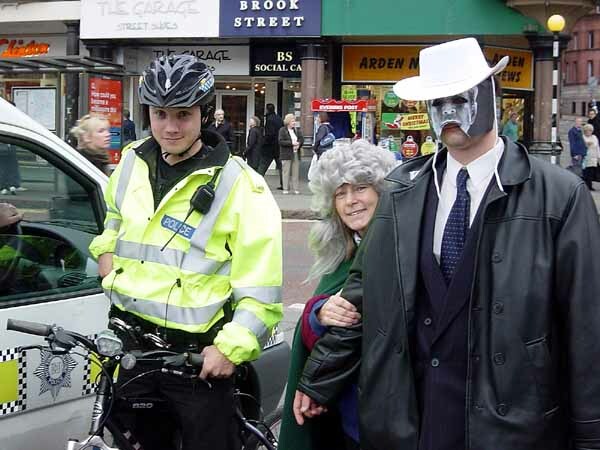 If you are obstructed – or assisted – by police, please don’t just shrug, but go to http://www.londonfreelance.org/policingto log a brief report, as soon as possible after the event. Mike.